Fort Dearborn Life Insurance Company is an Illinois-based company providing both individual and group insurance policies. They are licensed to do business in all 50 states as well as the District of Columbia, Puerto Rico, Guam, the British Virgin Islands, and the U.S. Virgin Islands. They are part of Dearborn National, a brand owned by Illinois-based Health Care Service Corporation. Fort Dearborn Life Insurance Company is one of four subsidiaries operating under the Dearborn National brand name. You can see competitive health insurance rates online by entering your zip code now. Fort Dearborn is probably best known for its Dearborn National dental plans. In fact, Fort Dearborn is the leading provider of group dental insurance to America’s employers. Their dental insurance is based on a preferred provider network (PPN) model where participating dentists and dental offices sign up and agree to provide services to plan members at a reduced cost. Consumers in major metropolitan areas have a large number of participating dentists from which to choose. Fort Dearborn and its fellow subsidiaries offer their products primarily on a group basis through employers. Although they do deal with individual consumers as well, working through larger groups helps keep costs down for both Dearborn National and its customers. The Dearborn National brand is represented at corporate offices in Downers Grove, Illinois. In New York State, Dearborn National is represented by Fort Dearborn Life Insurance Company of New York, with a local office in the upstate region. We have listed contact information and addresses for both offices below. The diversity of Fort Dearborn’s business indicates that local agents might be beneficial in some areas while not in others. For example, it is very common for life insurance to be sold through local agents, banks, and credit unions. On the other hand, group benefit packages for employers generally are sold and serviced directly through the insurance provider rather than through local agents. With all of that said, it is not clear whether Fort Dearborn is represented by any independent agencies. Most insurance companies that do work with agents provide a means to locate them through some sort of online agent locator tool. At the very least, mention of local agents can usually be found on a corporate website. In Fort Dearborn’s case, no such mention or tool could be found. If you are interested in learning more about the possibility of local agents representing Fort Dearborn, you can always contact either of the two offices listed above. The details for filing a claim with Fort Dearborn vary according to the type of policy in which you are referring. Regardless, the process always begins by visiting their website and choosing the appropriate forms. Fort Dearborn divides their business into three subcategories: group benefits, annuities, and workplace/individual. Each of these groups has its own forms menu enabling customers to find the correct claim form. If the form you need is not on the list, there is a link at the bottom of page to contact the company. All forms are downloadable in PDF format. Customers simply obtain the correct form, fill it out entirely, and either mail or fax it to the appropriate office. Instructions are included with the claim forms and you can always contact a representative if you need help. Once claim forms are received, they will be examined and forwarded for processing. How long it takes a claim to be paid will depend on the nature of that claim and the circumstances surrounding it. 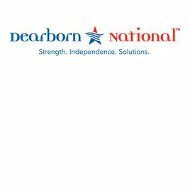 All Dearborn National brand companies receive strong ratings from both A.M. Best and Standard & Poor’s. Fort Dearborn Life Insurance Company leads the pack with ratings of A+ from both services. These ratings demonstrate their ability to meet all financial obligations to policyholders. The company prides itself in maintaining a strong balance sheet and employing sound investment strategies to help ensure company strength. Financial reports for the company, published in 2010, show them to be doing well. The report lists working capital of $5 million, a net policy surplus of $285 million, and total assets of $2.6 billion. It is not clear whether this data applies only to Fort Dearborn Life Insurance Company or to all of the companies that make up the Dearborn National brand. Regardless, the numbers do show Fort Dearborn’s financial strength. Enter your zip code into our free search tool to see competitive health insurance rates in your area.